It’s not often that I have the privilege of bestowing an honour upon a past member. This is special to me, because I’ve known this individual since my beginnings at the AWNA, and most of you know that was a long time ago. And our honoree started her career at an Alberta community newspaper even seven years before that, so you get the picture that we’re talking about a lifetime of service here. Our recipient is familiar with awards, having received the AWNA’s prestigious ‘Bill Draayer’ award in 1999, a CCNA Gold Quill in 2008 and the 2013 Marg Hennigar Award, presented by CCNA in recognition of serving both the community and the community newspaper industry with distinction. She received our association’s George Meyer Leadership award just last year, an honour given to newspaper publishers and staff who exemplify community leadership and volunteerism. 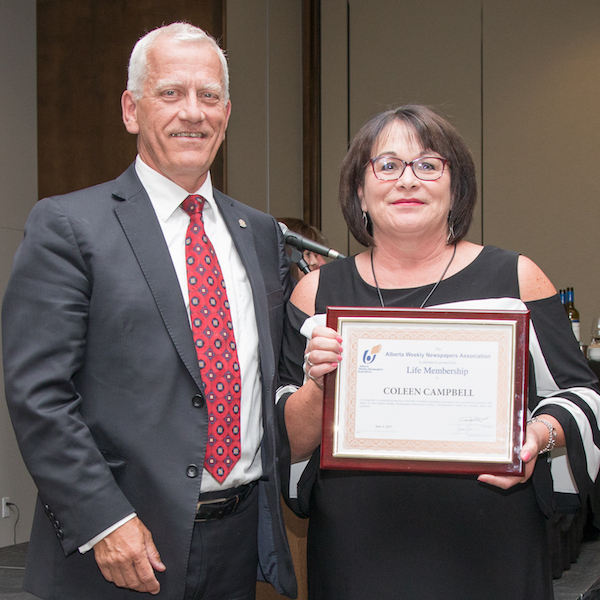 By now, many of you will have guessed that our honouree is Coleen Campbell, who retired in mid-2016 after more than four decades of shaping the weekly newspaper industry in southern Alberta. Coleen was 20 when she walked through the doors at the Taber Times, journalism diploma fresh in hand; ready to take on the world. Although she sensed that publishers George Meyer and Walter Koyanagi would be good mentors, she was pretty certain that she would soon be moving on to bigger and better things – Globe and Mail, New York Times. Young and idealistic Coleen soon realized that ‘bigger and better’ was close at hand in her new role at the Taber Times. It included parent advisory boards, day care boards, coaching soccer, Community Futures Development board, journalism advisory boards, arts and crafts committees, Taber Rotary, Taber and District Health Foundation board, charity golf tournaments and the APEX youth awards program. She also proved an excellent protégé of George Meyer in another sense, as it wasn’t long before Coleen and other staff were piling into their cars and heading off on ‘road trips’ to AWNA seminars and conventions. This early association involvement led to Coleen eventually serving as association director from 1988 to 2008, then included stints as AWNA president in 1993-94, CCNA president in 2007-2008 and chairman of the national board from 2008-2010. I got to know Coleen pretty well during her association years. You see, with Coleen, you’re never going to have a strictly ‘professional relationship’. She cares about people, and never fails to ask those important questions about how things are going. And she didn’t necessarily mean with the business. 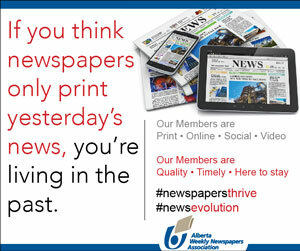 During her last five years of service to the industry, Coleen acted as publisher of the Lethbridge Herald, an Alberta daily once dubbed ‘the Globe & Mail of the west’ and she also looked after the company’s 13 community and weekly newspapers located throughout southern Alberta and southwestern Saskatchewan. These professional duties kept her away from active association involvement during that time period. Coleen still attended association meetings when she could, mostly to maintain the friendships and valuable business contacts she had cultivated over the years. Coleen Campbell’s selfless efforts on behalf of the Alberta Weekly Newspapers Association have earned her the respect of her peers. She has always been someone you can count upon. History showed, whatever project or position Coleen took on for the association, it was done exceptionally well. Her extraordinary willingness to help others in her profession and in her community will be a legacy not quickly forgotten. Ladies and gentlemen, please join me in welcoming AWNA’s newest life member to the podium…..Coleen Campbell.